The Singapore Cricket Club’s (SCC) cricket schedule was a busy one, with matches against the MCC XXIX Club, Crusaders and MCC over a three day period. 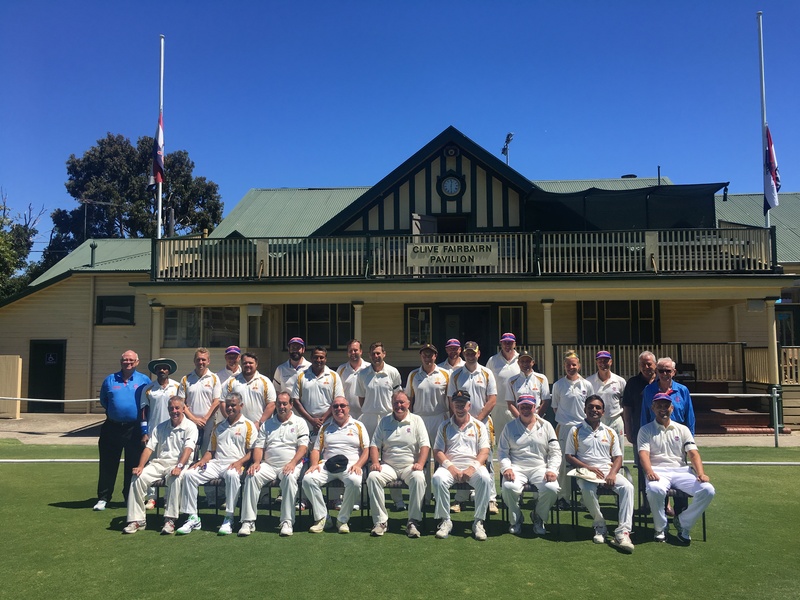 Most of SCC’s cricketers arrived in Melbourne on the Saturday so the cricket component of the tour commenced on Sunday February 4 when the XXIX Club hosted a 40-over-a-side encounter at the Albert Ground (both teams pictured). The XXIXers, although slightly past their best and out of regular practice, had a number of players with considerable Premier/District cricket experience. XXIX Club captain Michael Sholly won the toss and elected to bat. The openers got off to a solid start reaching the half-milestone none down before Mark Anderson was stumped for 13. The innings flowed from there with the major run scoring coming from former Carlton 1st XI cricketer Paul Whybird (50*) who top scored, former Victorian cricketer Ashley Gilbert who made a quick fire 46 and XXIX Club secretary Matt Stein, himself a former Dandenong and South Melbourne player, chimed in with 41 to post a competitive score of 6/208. For SCC James Kilby (2/29) and Madhu Thirikode (2/46) were the multiple wicket takers. SCC innings didn’t get off to a great start when Ash Gilbert struck opener Vijay Jeyaratnam on the pads in front in the second over of the innings to leave them 1/0. SCC rallied to be 3/42 before middle order batsman Dene Border (son of) was removed by Adam Rayner. Michael then turned to his veteran bowlers in Steven McCooke, Mark Anderson and Steve Williams in, either a show of sportsmanship, or to close out the SCC innings. Whatever his motive, the three bowlers took the last six wickets in a space of 10 overs, providing the XXIXers with a 152 run win. 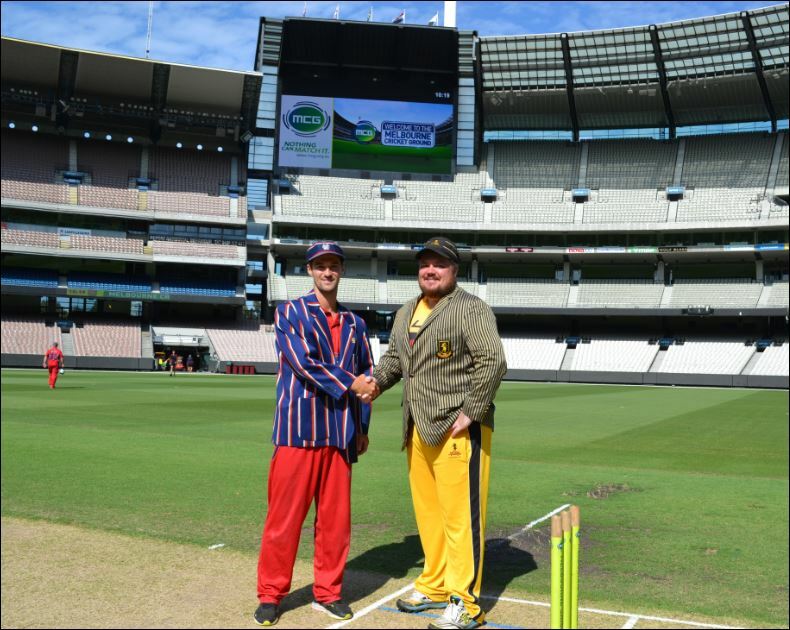 The ‘official’ match against the MCC was played on the MCG on Tuesday February 6. First XI batsman Meyrick Buchanan led the MCC team and having won the toss elected to bat first. Meyrick opened the batting with a quick fired 40 off 34 balls which saw the MCC team 1/82 off just 11 overs. His opening partner Jack Harper continued on the solid start taking the team total to 154 before being stumped by some sharp glove work to be removed for a well-crafted 75 (68 balls). Sam Brewin (39) and Fergus O’Neill (26) made top order contributions but it was the middle order partnership of Joel Ludik (80*) and Alex Cesarios (58*) that helped set a daunting total for the tourists. The two put on 103 runs off the last nine overs which took the total to 4/325 off the allotted 50 overs. SCC got away to a safe start even, with an asking run-rate of 6.5 runs per over, looking as though they were keen to preserve wickets for late flurry, being 0/34 at the 10 over mark. Kilbee was the first batsman ‘removed’ after being struck in the elbow by a sharp delivery from Keiran Elliott forcing him to retire hurt. SCC never really got on track of the run-rate although Rob Hands (77) and Andre De Lange (52*), a recent SCC playing member who now players Premier cricket with MCC, showed their class. Bowlers Fergus O’Neill (2/20) and Cameron Sturrock (2/31) were the only multiple wicket takers in SCC innings of 6/242 cc. Although both matches ended up in the home team’s favour, the camaraderie and sportsmanship between players was evident throughout. If post-match discussions are anything to go by, return matches in Singapore will be highly competitive!